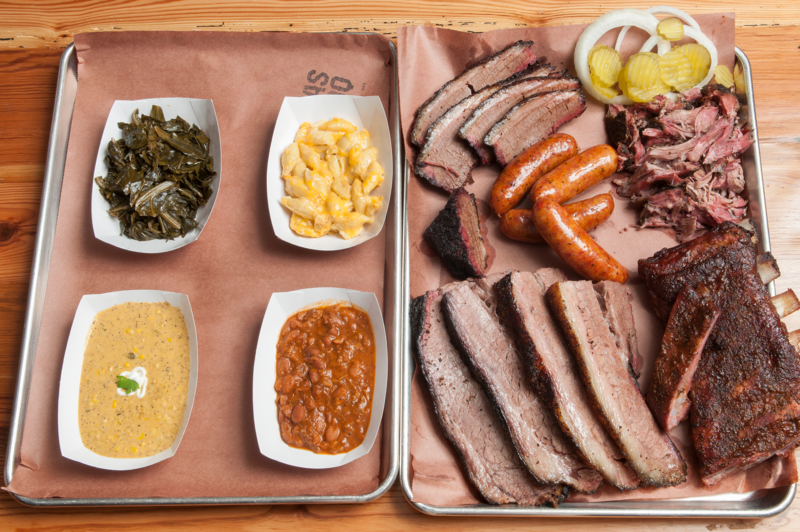 Atlanta is not (yet) a barbecue mecca. We do not (and will not) have a singular barbecue culture or style. And both of these facts bode well for new barbecue purveyors opening up shop — there’s still plenty of room for growth. Das BBQ is the latest promising upstart to join the scene, carving out a niche built on keeping it simple with good meat smoked slow and low. Consider it equal parts rural Georgia know-how and Austin, Texas, inspiration. Das BBQ opened up just before the new year in a former Pizza Hut on Collier Road in Underwood Hills, now a clean and spare temple to the smoked arts. Before you enter, you’ll pass two custom smokers dubbed Pancho and Lefty — both modeled after those used by the renowned Franklin Barbecue in Austin. You’ll notice that the intoxicating scent of hickory and pecan smoke continues on from the parking lot into the compact dining room filled with communal tables, as well as the covered patio outside. As is the custom in Texas, you make your way through the smoke-infused environs to the counter to place your order, where you can watch the meats get freshly sliced. No value assignedFranklin’s passion was born in a family of barbecue fanatics. “Throughout my childhood, every backyard we had was designed around smokers and grills,” he says, “and having 50 to 100 people in our backyard seemed like a weekly event.” In the '90s, Franklin’s father became a judge at major events like the Memphis in May World Championship Barbecue Contest, which brought another level of fanaticism to the family. More recently, Franklin’s uncle built Das BBQ’s custom smokers, and much of the pecan wood used in them (as well as the cane syrup used in the sauce) comes from the family farm in Stillmore, Georgia. No value assignedDas BBQ’s to-the-point menu lists ribs, brisket, pulled pork and sausage, available unadorned or as sandwiches stuffed into slider buns, plus six mostly traditional sides. You won’t find any crazy concoctions like Fox Brothers’ Tomminator, toppings like Heirloom Market’s Korean-fusion kimchee, appetizers like B’s Cracklin’s fried pickles and pork skins, nor nods to healthy eating like Community Q’s Kitchen Sink Salad. On your first visit, work up an appetite in advance, then go with the quad meat plate that includes all four of the main menu items ($26, including two sides, versus $14 for a single meat). This takes away the inner conflict inherent in having to decide — though you do have to make a choice between regular or jalapeño when it comes to the sausages, brought in from Meyer’s Smokehouse in Elgin, Texas. In keeping with the simple menu, the meats are rather austere, relying mainly on the smoke to work its magic. They come with a small pile of pickles and onion and two types of sauce at the ready on each table should you feel so obliged (though, really, try without sauce first). Das BBQ offers a unique tomato-based sauce that employs local Octane espresso as well as Franklin’s own Georgia cane syrup, and another sauce with a base of pureed Georgia peach that’s reminiscent of a sweet pepper jelly. No value assignedAmong the sides, the collard greens and mac and cheese are well-executed staples, though the spicy elote cream corn warrants a diversion from standard barbecue sides. The one not to miss is the brisket bark pinto beans — plump and meaty with a peppery bite from the bits of brisket mixed in. There’s also a mostly-local craft beer menu and wine by the glass. Two months in, folks are lining up each day to get a taste of Das BBQ’s Georgia-meets-Texas style, though it’s nothing compared to the fanatics that gather each morning around 7 a.m. at Franklin Barbecue in Austin. Even if Das BBQ doesn’t quite drum up the kind of passion found in Texas, it’s a welcome addition to Atlanta’s barbecue scene, and promises to spawn more Das BBQ locations in the future if the crowds continue to line up.